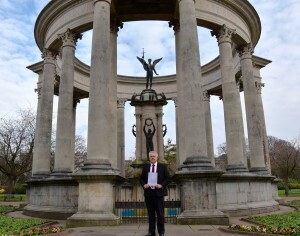 First Minister of Wales Carwyn Jones has today launched Programme 2017 to mark the centenary of the First World War. 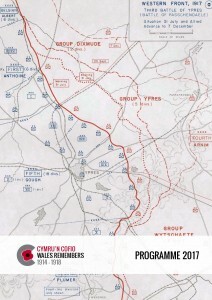 Programme 2017 is the latest in the Welsh Government’s series of annual Cymru’n Cofio Wales Remembers 1914-1918 brochures which highlight events and projects of Welsh interest taking place in Wales and further afield throughout the year. The launch coincides with the First World War Partnership Day 2017 event held in Builth Wells on 26 January. 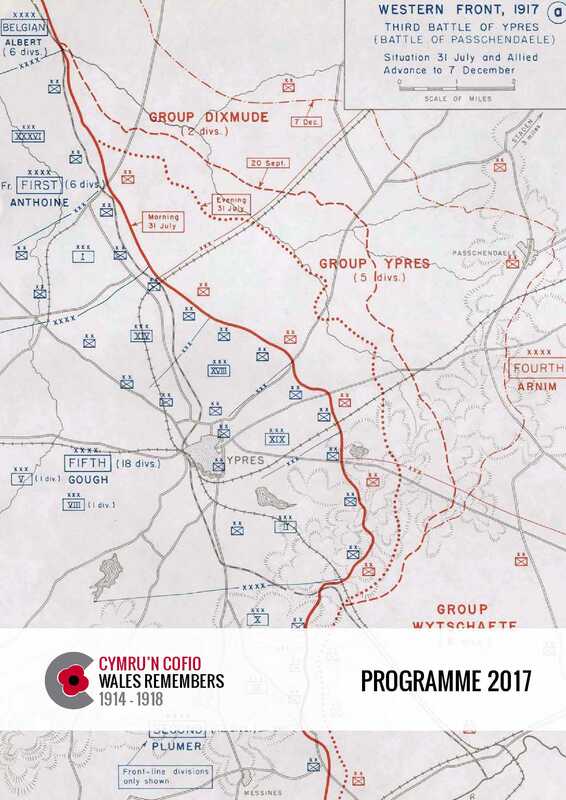 The central focus for this year’s commemoration is the Third Battle of Ypres (Passchendaele), which will be commemorated at a National Service of Remembrance at the Welsh Memorial in Langemark, Belgium on 31 July 2017. The Third Battle of Ypres is of particular resonance for Wales as it claimed the lives of many Welsh soldiers including the renowned Welsh language poet, Hedd Wyn. Hedd Wyn was killed on 31 July 1917 and is buried at the nearby Commonwealth War Graves Commission Artillery Wood cemetery close to Ypres. People are welcome to attend the National Service of Remembrance but must register in advance at the following link by 26 March 2017: www.smartsurvey.co.uk/s/flanders Entry will be by pre-booked tickets only. Other key events include the re-opening of Hedd Wyn’s home following the £3.4 million re-development led by Snowdonia National Park Authority and supported by the Welsh Government and the Heritage Lottery Fund. The Welsh Government will also hold a number of cultural events in partnership with the Government of Flanders on the shared history of Wales and Belgium. First Minister Carwyn Jones said: “Cymru’n Cofio Wales Remembers 1914 – 1918 gives us the opportunity to remember the lives of those who served in the First World War. “The sacrifices the people of Wales made, alongside the rest of the UK and allied forces, should never be forgotten. Programme 2017 is testament to the outstanding level of collaboration and engagement seen across Wales since 2014, which set to continue through the year and beyond.